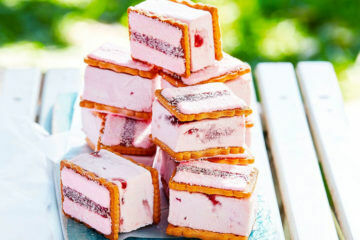 One of the key summer essentials, a hat should be packed in every Aussie kiddies backpack. 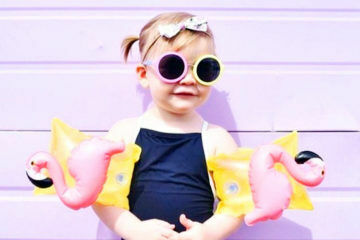 Sun protection is paramount to ensure your little adventurer doesn’t get scorched. But in the search for a sun-safe hat, there is no need to compromise style. From eye-catching graphics and bright colours to soft patterns and delicate floral details, we’ve found plenty of hats to keep their noggin covered. 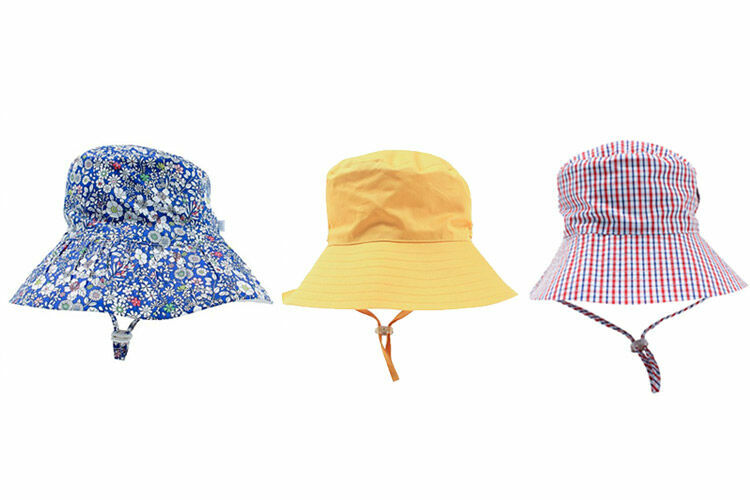 Here are the best toddler sun hats for daycare and kindy. Seed Heritage Dino Sunhat ($29.95): Get two cool hats in one with this red and blue reversible sunhat. The denim side features embroidered dinosaurs, while the bright orange reverse has a vibrant stripe band for a fun pop of colour. 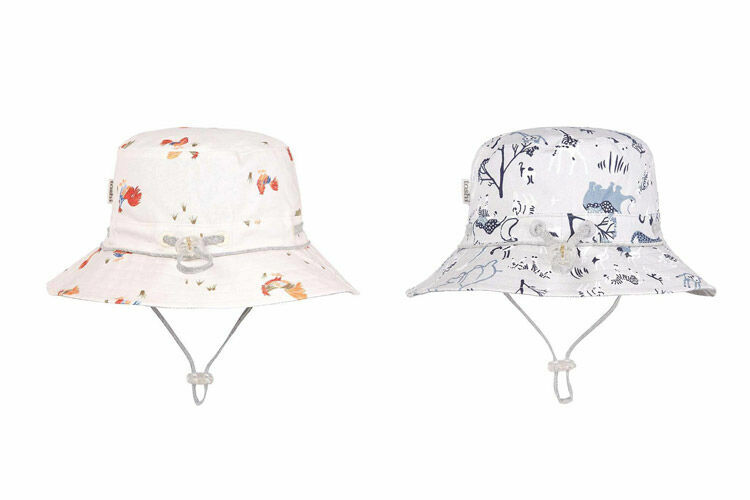 Bebe by Minihaha Sun Hats (from $32.95): Floral, block colour and check. 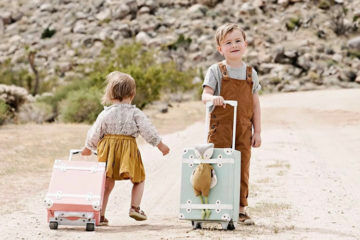 Mini sun seekers will have plenty of protection in plenty of styles. 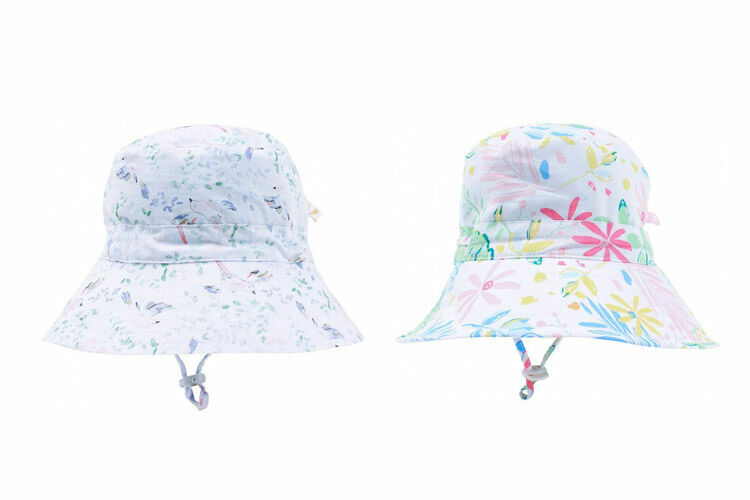 These sun hats feature an adjustable head and face strap, plus an easy push toggle for nimble fingers. Peggy Melissa Hat ($39.95): Pretty and playful, this sun hat is everything we love about summer. It’s abstract floral print and pretty fixed bow detail tick all the style boxes while the lightweight and breathable fabric have functionality covered too. 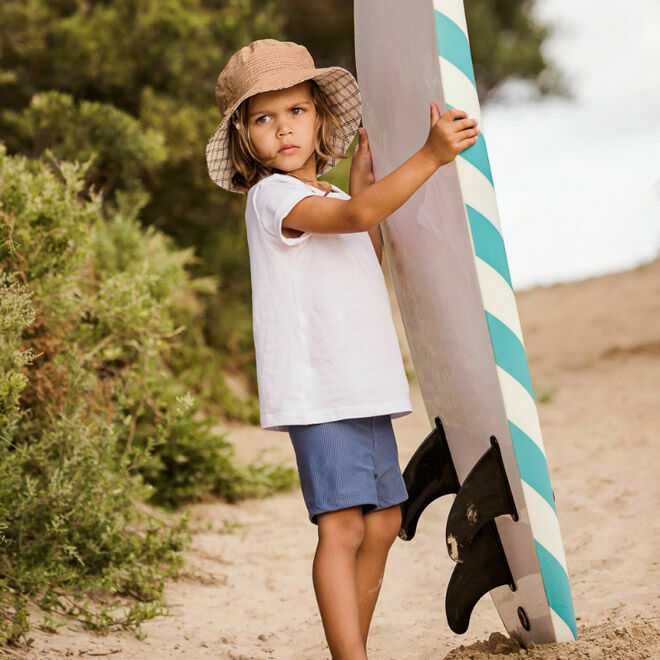 Aqua Blu Kids Lycra Hat ($34.90): Made with Aqua Blu’s exclusive long-lasting and fibre breakage resistant LYCRA® XTRA LIFE™ swim jersey, these hats are flexible, quick drying and offer UPF 50+ sun protection. Oobi Bridgette Wide Brim Lemondae Hat ($29.95): When we say wide brim, we mean it! 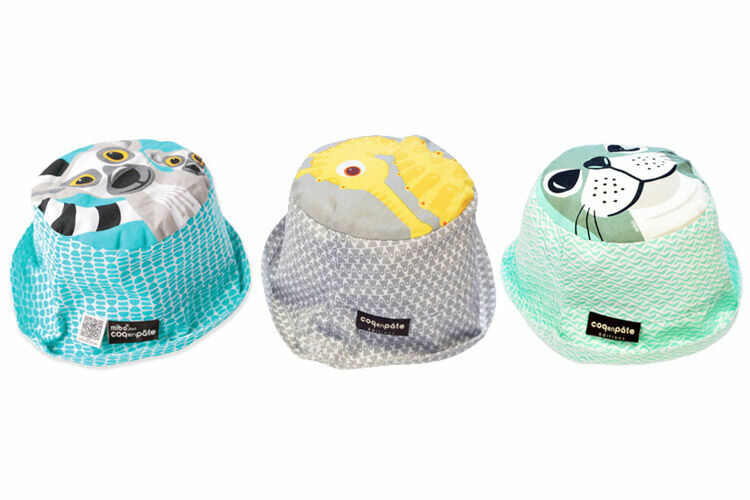 The gorgeous hats from Oobi will keep your whippersnapper safe with their style on point. 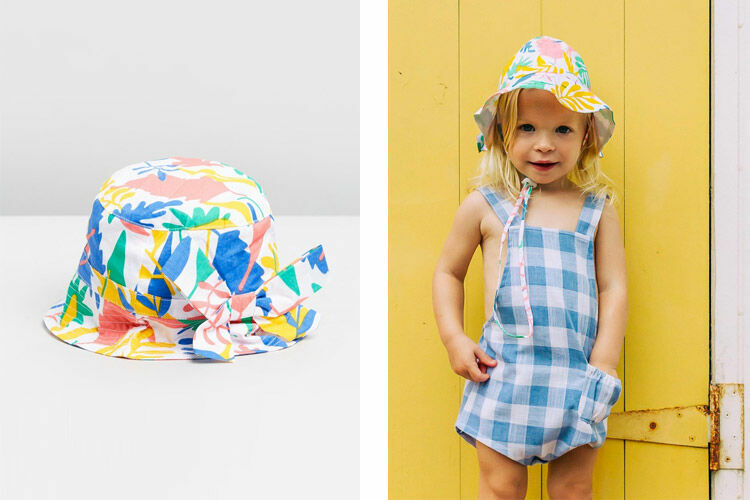 An extra-wide brim, toggle and straps help this toddler sun hat to stay put. 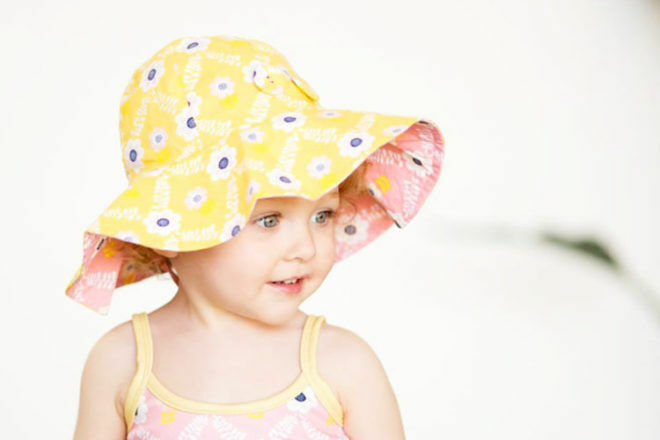 Walnut Baby May Gibbs Sunny Hat ($36.95): Spread the summer vibes with these gorgeous sun hats. With May Gibbs-inspired Snugglepot and Cuddlepie prints, we wish these came in an adult size too! Mini Boden Jersey Reversible Hat ($32): Mix things up with a simple flip of the hat! With an eye-catching print on one side and bright stripes on the other, this classic reversible number will match any outfit or outing perfectly. 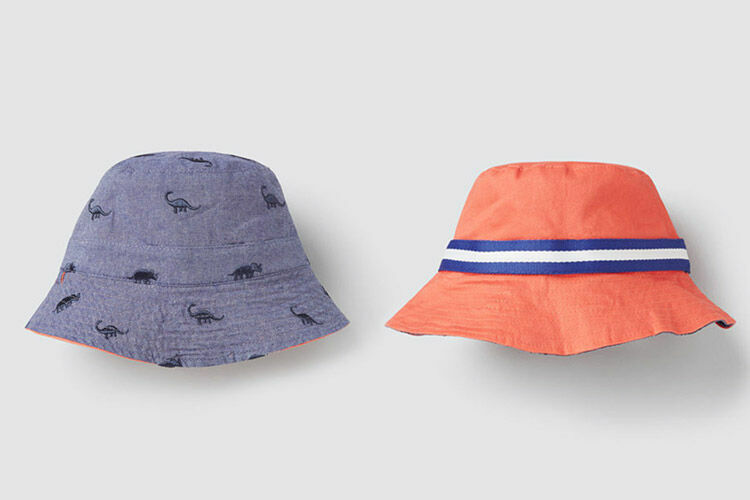 Cotton On Kids Bucket Hat ($16.99): The bucket hat is a summer must and Cotton On Kids offers a wide range of colours and styles for all. Each hat features an adjustable, self-tie chin strap to make sure it stays on while the kiddies play. Acorn Dreamtime Infant Hat ($34.95): Melbourne-based label Acorn Kids are heating things up with sizzling designs this summer. We love the chestnut base with black dash print – too cool for school! Target Reversible Block Bucket Hat ($12.00): Be sun-smart and look the part with a reversible bucket hat crafted from comfy and breathable cotton. An affordable option made to stand the wear and tear of daycare. 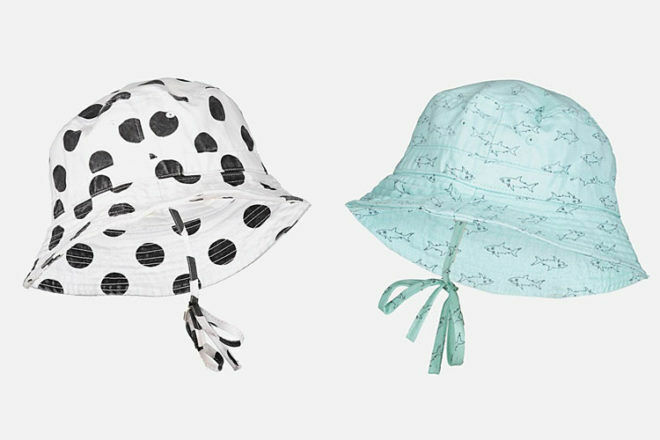 Toshi Sunhat ($34.95): If your little one is all about the animals they’ll love the sun hat collection from Melbourne-based Toshi. Featuring fun prints of zebras, cheetas, roosters and more, toddlers can stay sun-safe while showcasing their favourite furry friends. 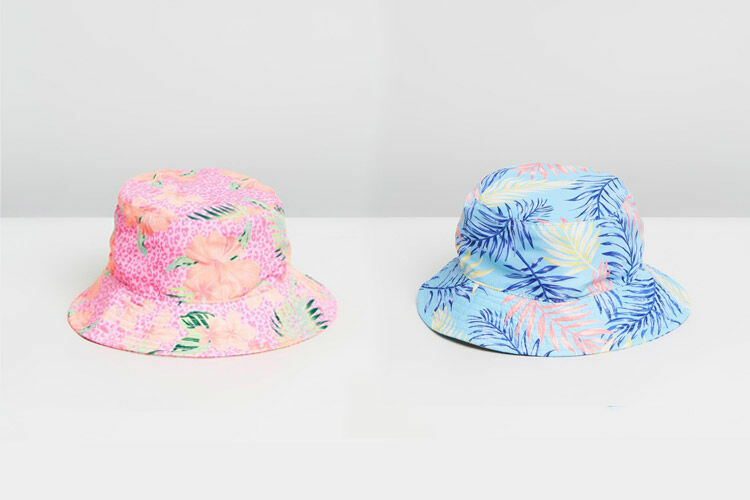 Bedhead Hats Bucket Hat ($30.95): Hello cutie! This guys at Bedhead Hats offer a range of sun hats for boys and girls while having a selection of unisex designs too. 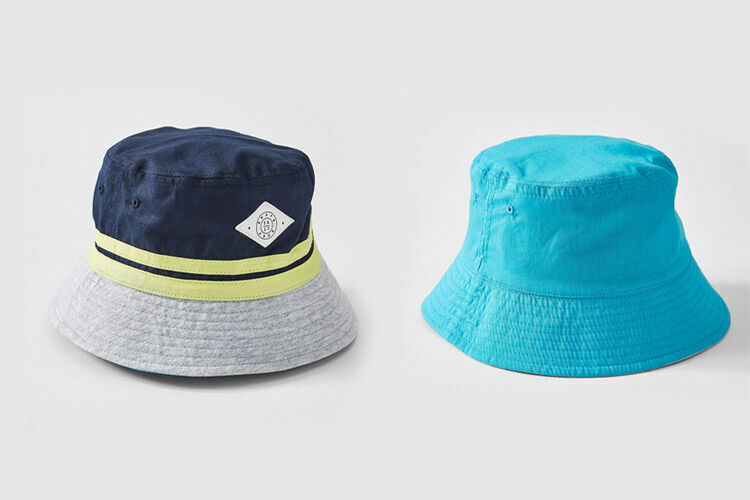 Their bucket hat is rated UPF50+, made from super-stretchy, lightweight cotton with a soft brim and all-important chin strap. 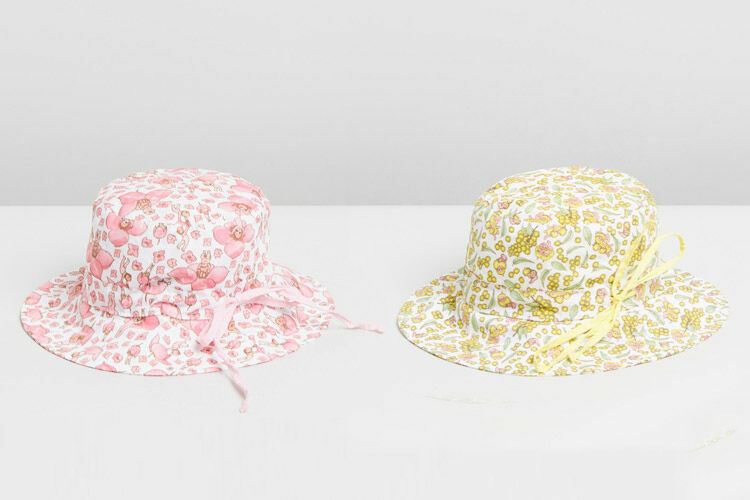 Fox & Finch Sunhat (from $32.95): Look pretty as a picture in these darling and dainty sun hats. The full brim coverage and chin strap with added toggle ensure protection all day long. 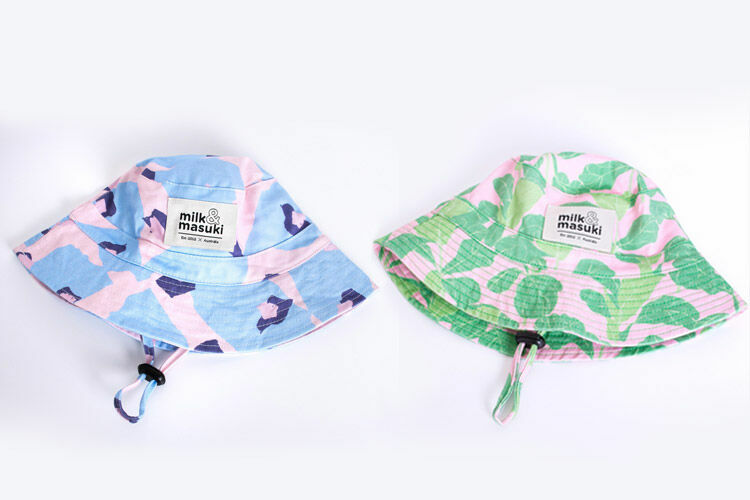 Milk and Masuki Bucket Hat ($39.95): Topping off their summer look just nicely, the Milk & Masuki hats are made from organic cotton and designed for style-savvy kids. 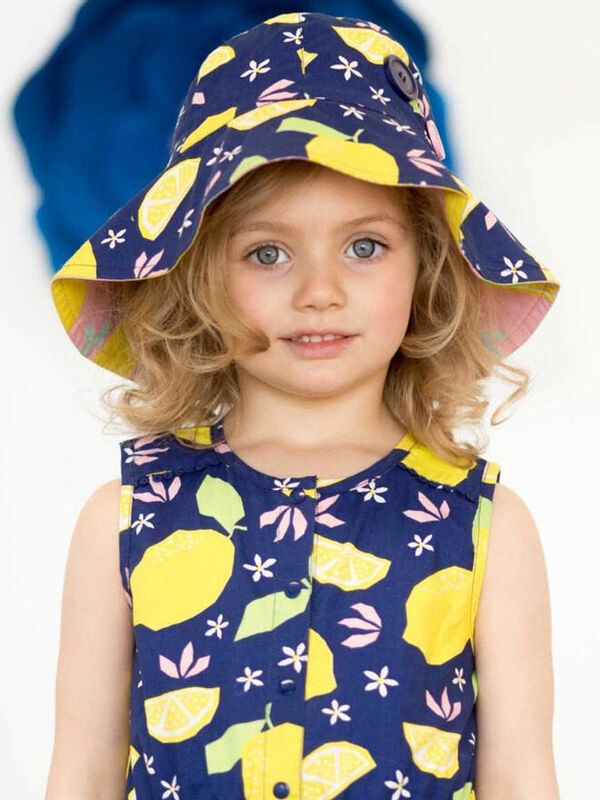 Little Frenchy Kids’ Sun Hat ($25.00): Meet the colourful gang set to add some serious fun to your bubs outdoor activities. 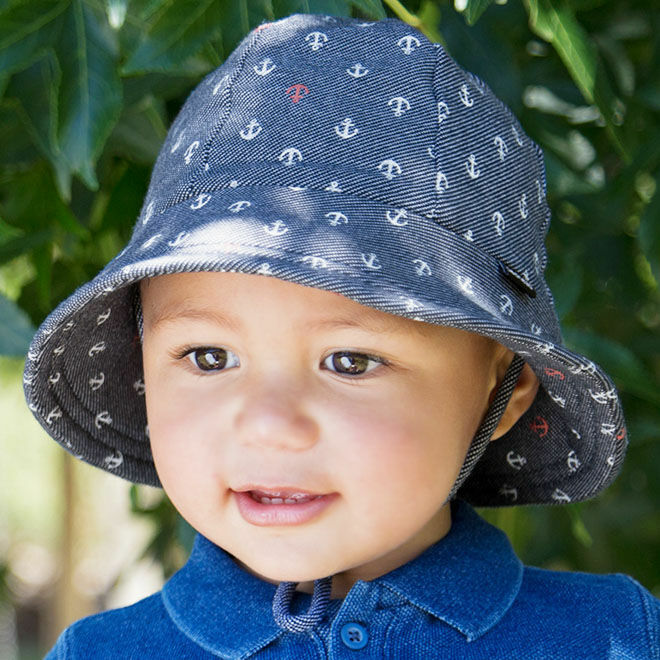 Made of 100% organic cotton, these super cute sun hats have a little stretch in them too. 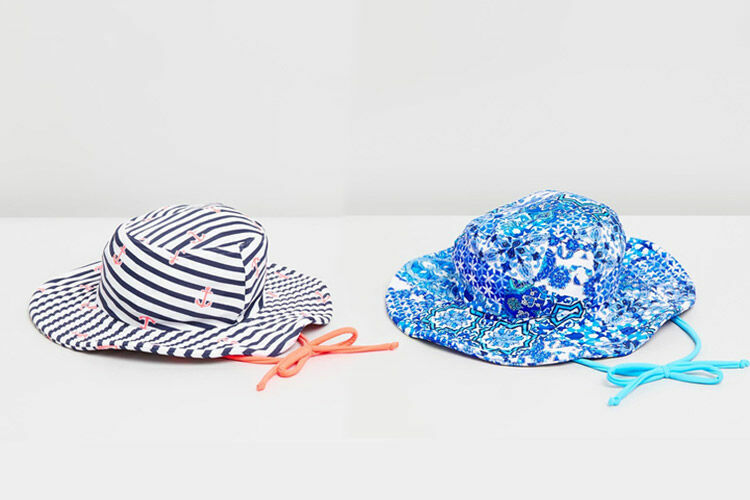 Rip Curl Kids Swim Hat ($35.99): Vibrant summer patterns are the icing on the cake for these electric sun hats. Made from smooth woven fabric they have a buttoned chin strap to keep them secure around the kiddos chin too. 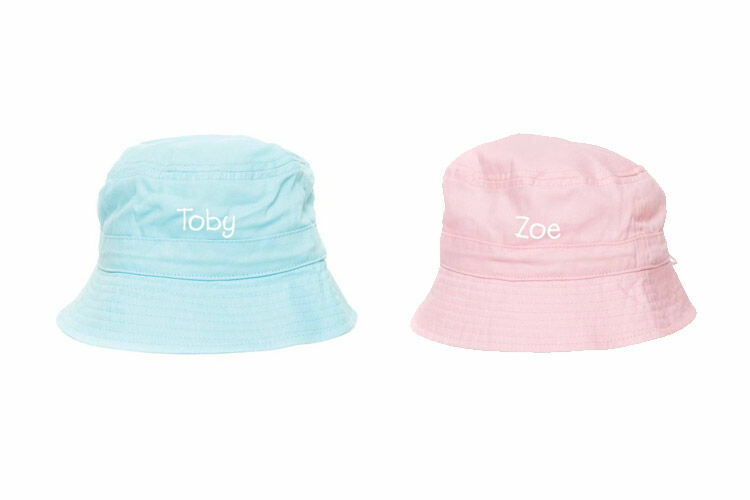 Identity Direct Personalised Bucket Hat ($27.99): Don’t risk losing another hat – have their name permanently embroidered on the front! Available in three colours, all come with a wide brim and an elastic drawstring fastener for the perfect playtime accessory.